Black Ginseng The source of health, black ginseng! a careful process which makes it darker. Black ginger is made of ‘goojeunggoopo’ which steams and dries ginseng nine times. While being steamed and dried repeatedly, The red color of the ginseng Has gradually become black, to form the black ginseng. Black ginseng improving strength includes a number of polyphenols With antioxydative and ginsenoside properties in comparison with Ginseng and red ginseng. Black ginseng is matured unpeeled at low temperature so that the saponin content can increase further. 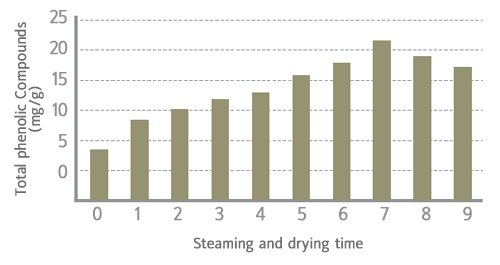 When it is matured at low temperature for a long time, the saponin content can increase much further. In a process where raw ginseng is made into black ginseng, starch particles of ginseng absorb water while being in the form of liquid and sol. Then, it becomes gelatinous and easy to digest. Harder you press down the brush, darker ink becomes. Likewise, darker ginseng becomes, further active ingredients increase. Black ginseng is highly effective against active oxygen that causes diseases and aging in the human body, which implies that it can be used as an antioxidative pharmaceutical compound and health food if further studies are conducted. The total phenol content in black ginseng reaches about 20mg/g, which is higher than that in red ginseng (15mg/g). The antioxidative activity is in proportion to the total phenol content. The anticancer activities of black ginseng is over 10 times higher than that of red ginseng, which is equivalent to that of Taxol, an anticancer drug. PK1 and RG5 ginsenosides, extracted from black ginseng, inhibit the differentiation of fat cells and are expected to be used to treat metabolic syndrome accompanied with obesity and hypertension. Moreover, black ginseng extract is effective against memory impairment caused by ethanol, which means that it can improve memory and activate cerebral function. Black ginseng washes away fat, thrombi and cholesterol in blood vessels and thus improves blood circulation. In addition, it can prevent vascular diseases such as arteriosclerosis and hypertension, cardiac diseases such as angina and myocardial infarction, and cerebral diseases including infarction.